This whacky episode begins with a discussion of Chewbacca’s comic book dialogue and just gets weirder from there. Hosts Michael Bailey and Scott H. Gardner bring you yet another exciting chapter in the ongoing saga of comicdom’s first super-team!! First up, Michael recounts The Atom’s Indiana Jones-esque adventure from All-Star Comics #3 (the JSA’s very first get-together). Then it’s on to the feature event, an in-depth discussion of All-Star Comics #65 where we find Superman battling for his very life against the fiendish schemes of Vandal Savage!! Character Spotlight this issue zooms in on Alan Scott, the ORIGINAL Green Lantern, and last but not least — BECAUSE YOU DEMAND IT! — still more zany comic book ads!! 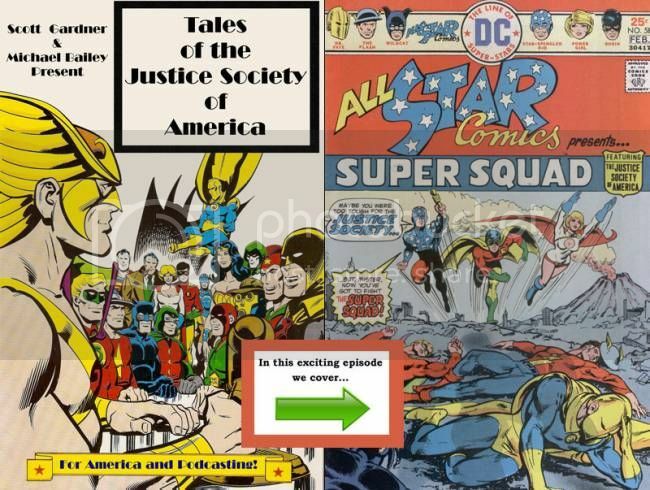 In this episode, hosts Michael Bailey and Scott H. Gardner take an in-depth look at the 1976 return of the Justice Society of America in the pages of their original title — All-Star Comics!! Specifically, they review issue #58, also deliver a bit of JSA news, character spotlight Power Girl, and wrap the whole thing up with a hilarious discussion of the classic comic book ads found in this issue — such as Hostess Fruit Pies, The Six Million Dollar Man Action Figure, and the Evel Knievel Stunt Cycle! !